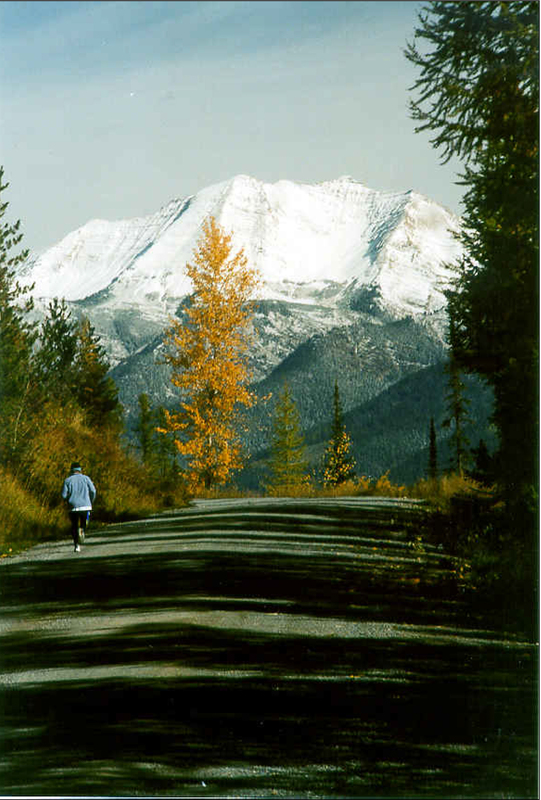 1982 – Le Grizz is Montana’s first Ultramarathon. 14 of the 16 finishers had never run farther than a marathon. 1983 – The runner statuette on winner Rick Spady’s trophy is broken off at the knees in shipment. Other winners cry foul, demand similar trophies. 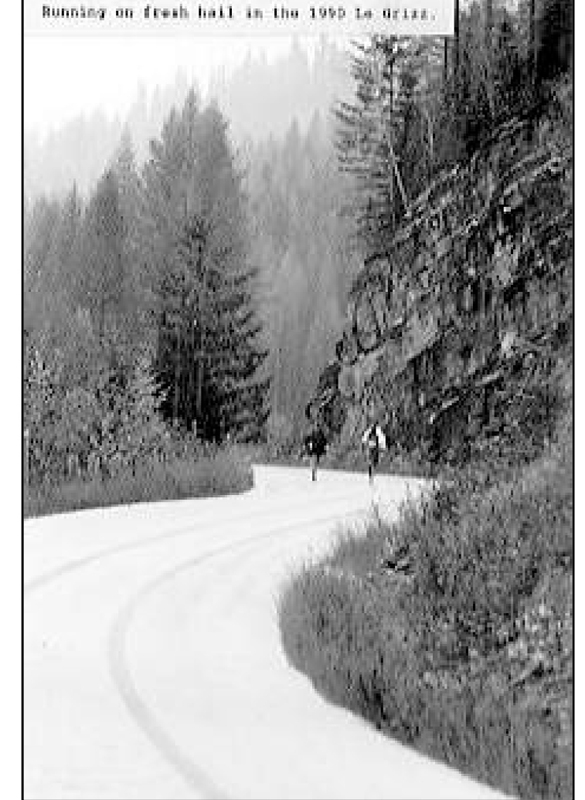 1984 – A sleet storm is too much for seven veteran ultrarunners, who drop out. All entrants attempting 50 miles for the first time finish. 1985 – Bobbie Dixon (now Pomroy) wins the womens’ race in a nationally ranked 6:37:53. 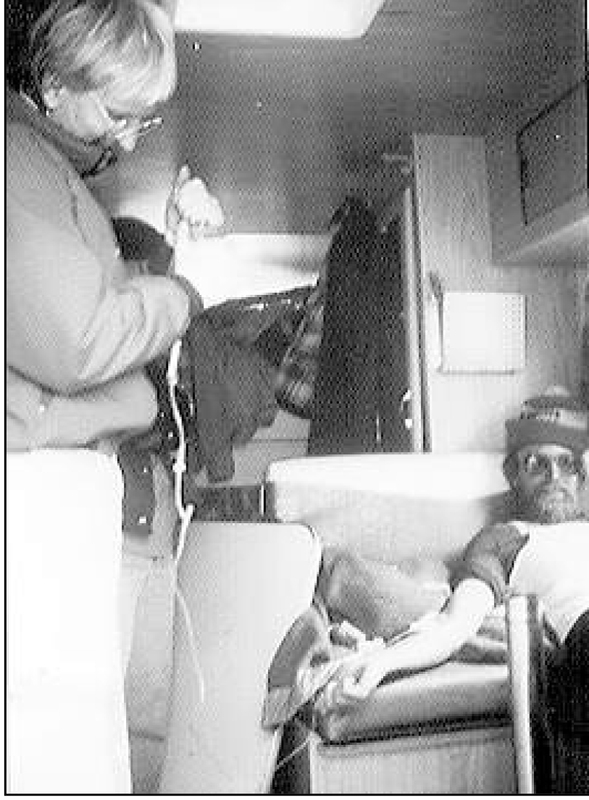 1986 – Mike Schmahl receives an IV of Ringers Lactate at 37 miles after sustaining metabolic blowout. He then completes the run in what is still the fastest last-place finish. 1987 – Don Kardong runs the event and wins. His awesome article about his experience soon appears in Runner’s World, and Le Grizz instantly has national recognition. 1988 – Bret Doucett is knocked to the pavement 50 yards from the finish, picks himself up and finishes with bruises and a sprained ankle. 1989 – Romel Mackelprang is medically disqualified, but finishes anyway and is reinstated. 1990 – A massive storm strikes during the event, completely covering the road with hailstones. 1991 – Andy Nicoll runs in a ripped 3-piece suit as a simulated grizzly mauling victim. 1992 – Dennis Clute lines up his drop bags in front of the Race Director’s truck for delivery to the course. The Race Director runs em right over for him. 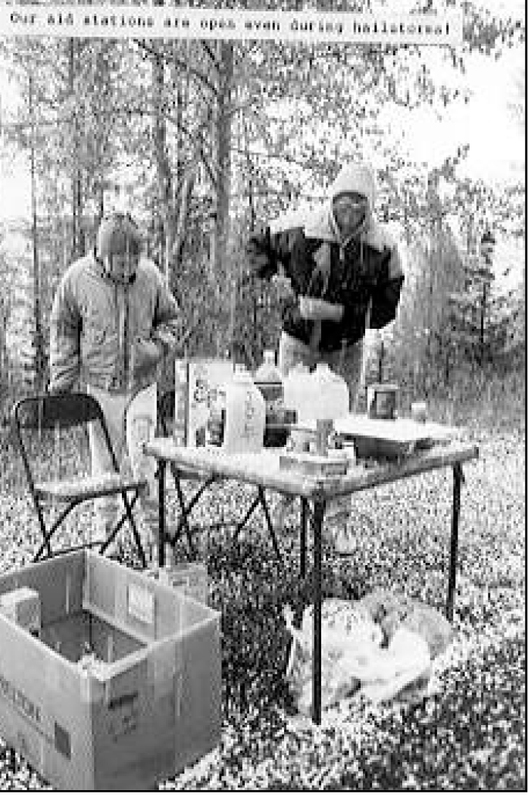 1993 – The first two dozen finishers are handed 22-oz bottles of Big Bear malt liquor at the finish. 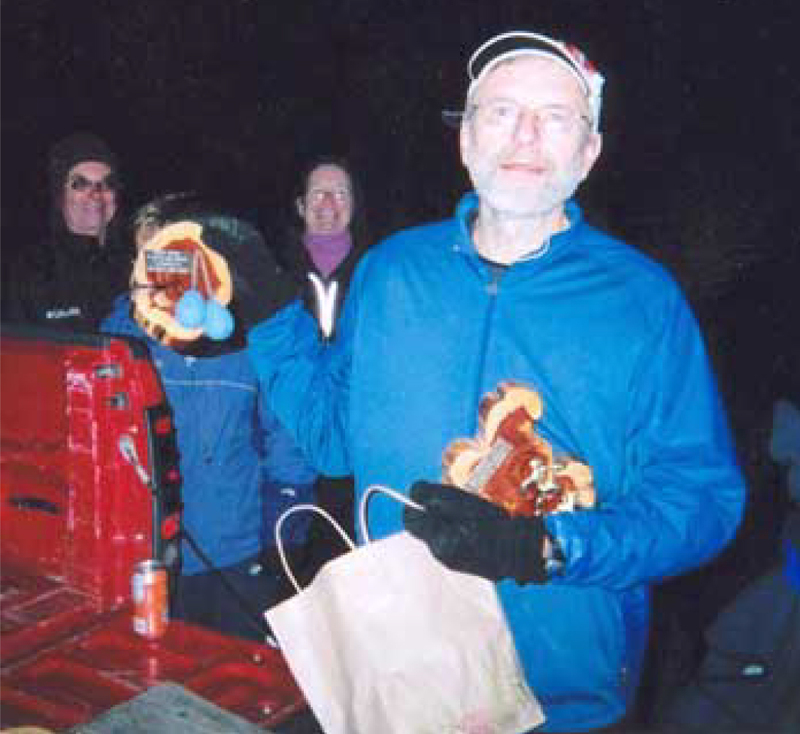 1994 – Carlos Tallent completes the event six months after heart bypass surgery. 1995 – A bandit runner finishes second in 5:52:26. 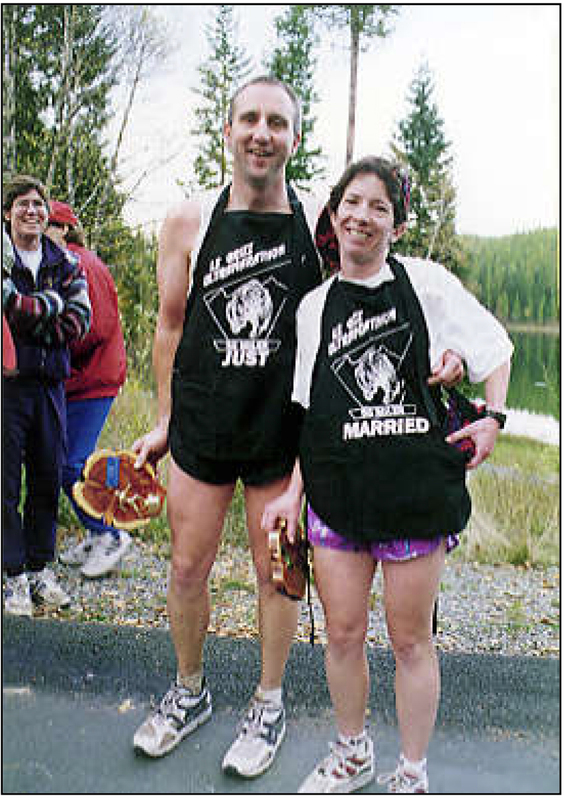 1996 – Jim McKenzie & Colleen Marrinan attend for their honeymoon, get Le Grizz aprons. 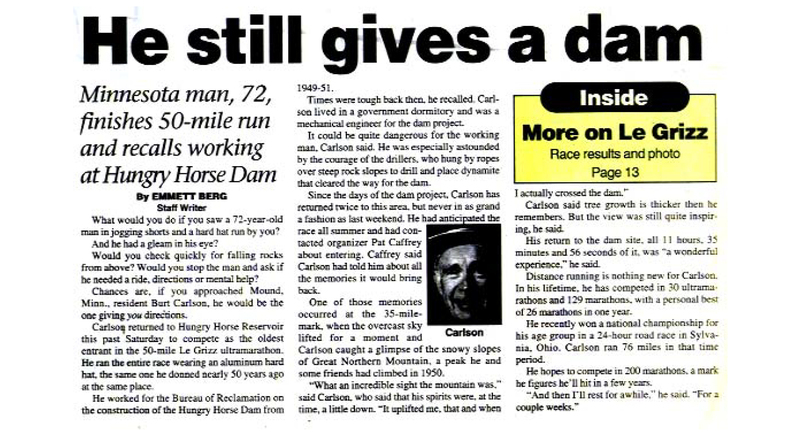 1997 – Burt Carlson, 72, runs across the dam he helped construct 48 years before, wearing the same hard hat. 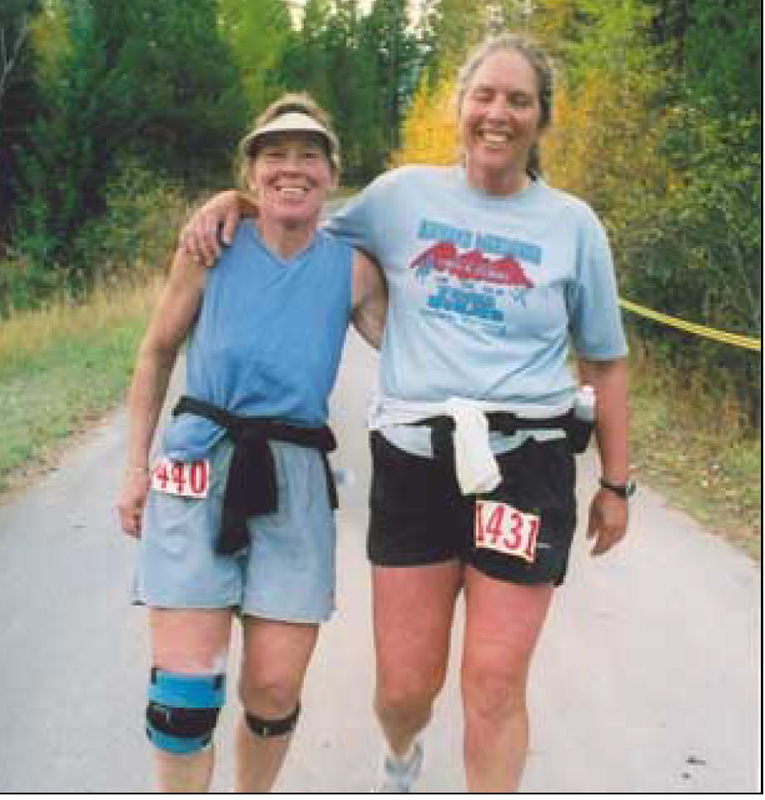 1998 – Le Grizz finally gets some respect as the Montana USATF 50-Mile Championship. 1999 – Matt Darrington, 12, completes the run. 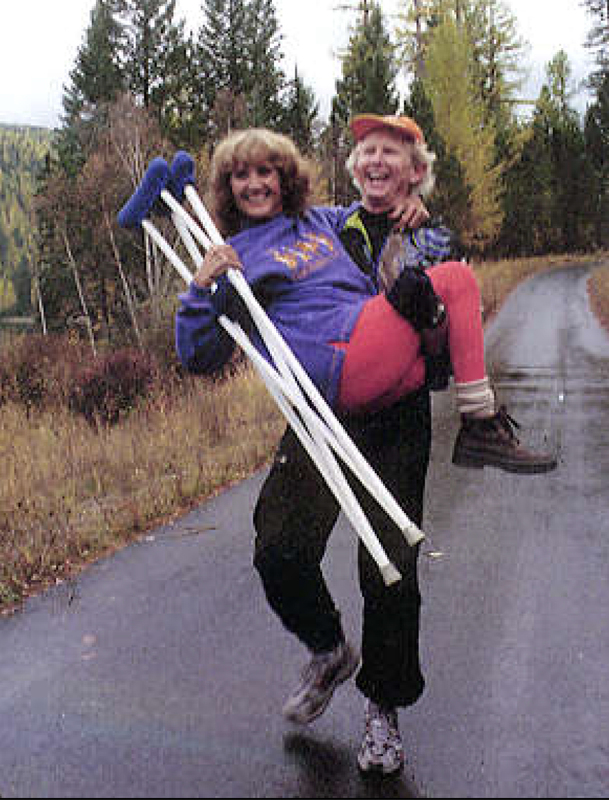 2000 – Dan Brendan carries amputee wife across the finish line, demonstrating proper technique for support crew retention. 2001 – Maynard Kicking Woman, elder of the Blackfeet Nation, is Master of Ceremonies for the first awarding of the Chief 10 Bears to Skookumtumtum Heaps. 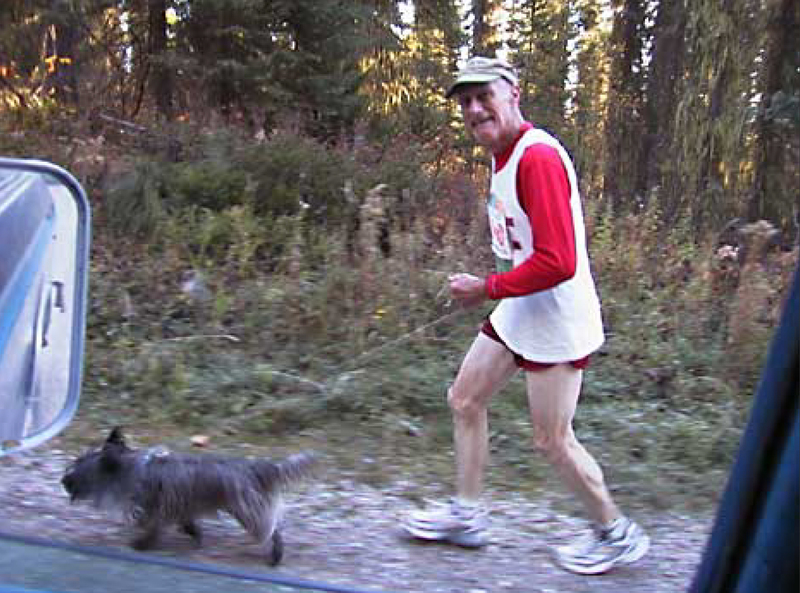 2002 – Mark Tarr (shown above at 31 miles) wins Le Grizz for the 10th time. 2004 – Entrants at the starting line experienced the first “Test Firing” of The Official Le Grizz Starting Device, pre-empting a recurrence of the 2003 problem noted above. Being unannounced, the sudden 12 gauge blast scared some and incited other to commence running. Turned out to be a great way to instantly get the chattering field’s undivided attention for the pre-race announcements. 2005 – Skookumtumtum Heaps has completed every Le Grizz, sometimes under considerable duress. 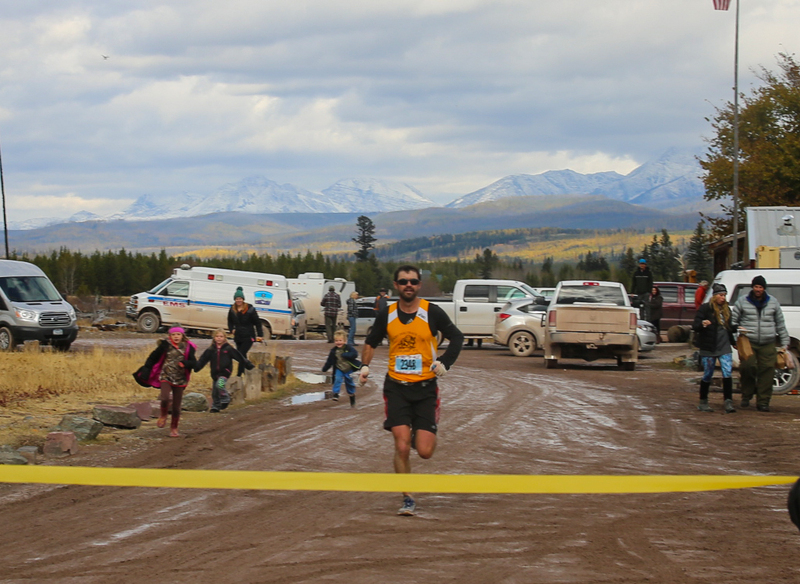 This year, thanks to the services of Massage Therapist Debbie Bloomfield, he was able to once again tough it out. For his extra effort he received the now-coveted Cialis Award. 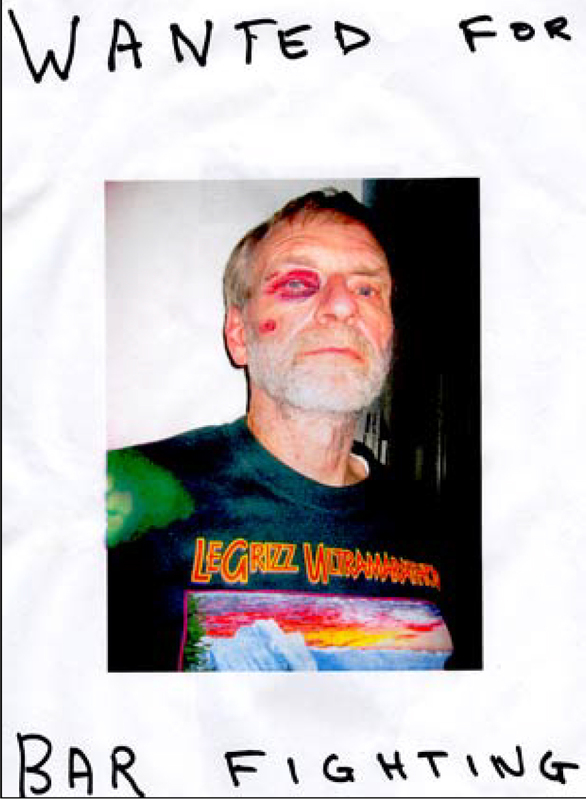 The inscription “I had to seek medical attention at Le Grizz” says it all. 2006 – Jack the dog takes charge, showing Bob Hayes the way to his 10th Le Grizz completion at age 80. 2007 – Yes, it IS all about you. This year belonged to the ladies, both a record number (29) and percentage (34%) of finishers. Cindy Weaver, 50, won the Seniors Division in her 1st 50 (above). Le Grizz veterans Margaret Smith and Allie Wood finished together (lower left). Kendra Borgmann, backed by support crew Jenny Newton, kept warm after nearly besting the 22-year-old Women’s Course Record (lower right). 2008 – The Melee in Couer d’Alene: Skookumtumtum Heaps got in an altercation with a gas pump hose en route to Le Grizz. 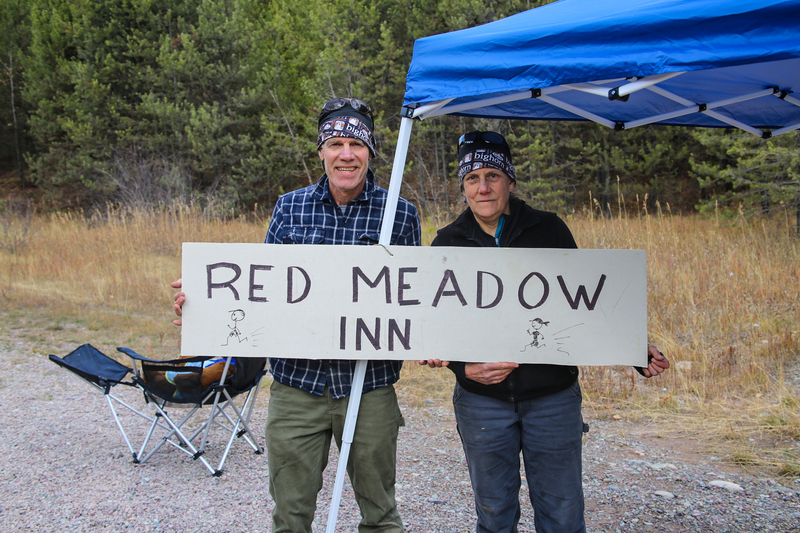 Bill Greene was thoughtful enough to capture the moment in a handmade poster taped inside his vehicle window at the starting camp (left). We hadn’t seen this look since the days of the Grizzly Bear Artificial Insemination Team. Skookumtumtum was also recovering from cancer treatment, yet continued to log another completion (right) in spite of his latest adversities. 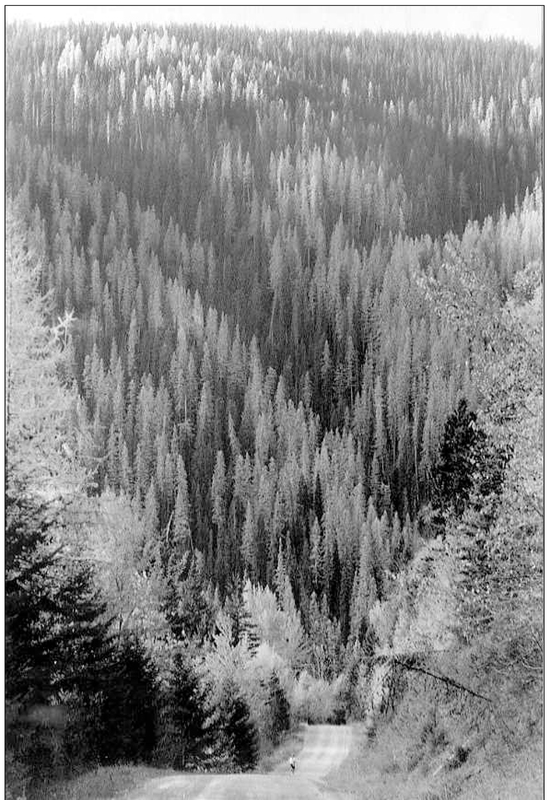 A half-dozen young runners and their support crew pillaged their way from southwestern Idaho, all sporting catastrophe-orange T-shirts captioned front and back (below) and non-matching knitted caps with teddy-bear ears, horns, pac-man teeth and other motifs of the goofball culture. 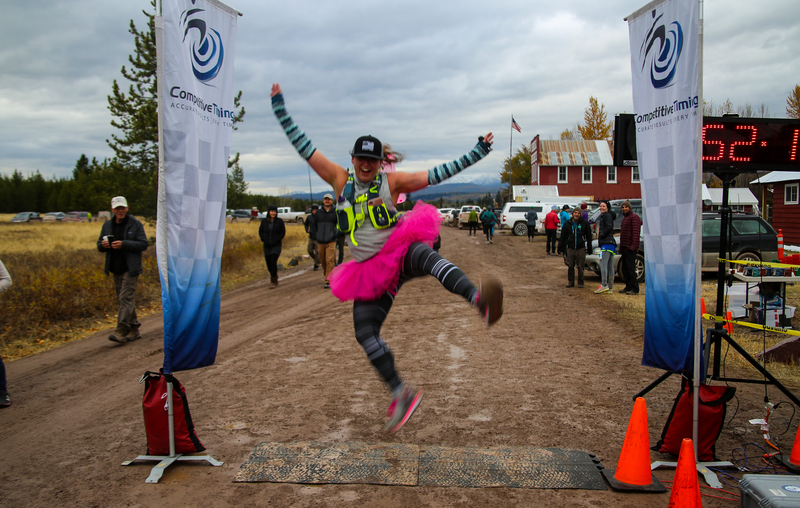 Most were first-timers at 50 miles, but all finished in grand buffoon style, and by all indications persevered in their festivities beyond the finish. 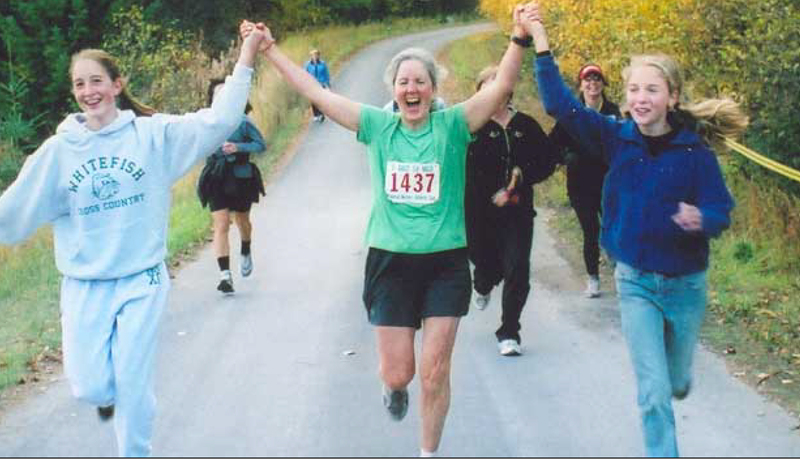 2010 – Gunhild Swanson wins the Seniors Division as the oldest woman to ever run Le Grizz. 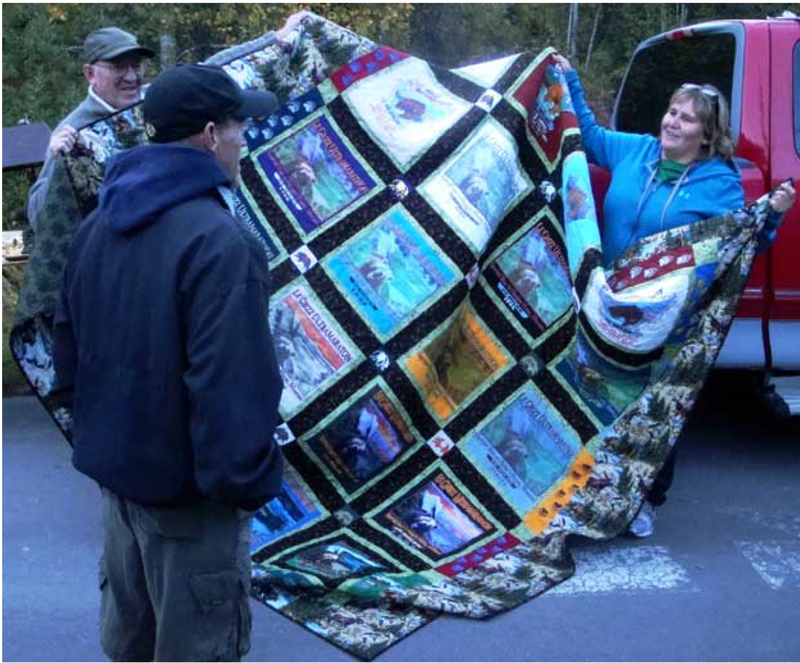 2011 – Mark Tarr, upon completion of his 20th le Grizz, is presented a quilt of his T-shirts by his wife Yvonne. 2012 – Crew vehicle slides off wet road, perches precariously. Extracted by wrecker. 2013 – Six of our eight Chief 10 Bears recipients reunited with Blackfeet elder Maynard Kicking Woman to confirm Chief candidate Jim Ballard and 2011 Chief recipient Mark Tarr. A confirmation includes bestowing a Blackfeet name. As it will be at least six years before another Chief candidate may emerge, the meeting served as a possible final gathering for our brotherhood of Chiefs. Mr. Kicking Woman takes a Chief confirmation quite seriously, and only other Chiefs and invited witnesses such as family or those appreciative of tribal lore may attend them. The Blackfeet names that are bestowed are private honors. The R.D., who never attends confirmations, knows the names, but has not and never will publish them. 2014 – In spite of heavy rain/hail during the afternoon, the event was well attended, in part as a farewell to Pat Caffrey, who is retiring as Race Director after serving 33 years. Three of the nine Chief Ten Bears recipients competed, and all the other six were in attendance. Heather Cauffman and Will Hammerquist were introduced as prospective race managers starting in 2015. 2015– The Le Grizz packed up and moved to Polebridge. The weather was unseasonably warm making race day beautiful but a bit warm for cool running weather. 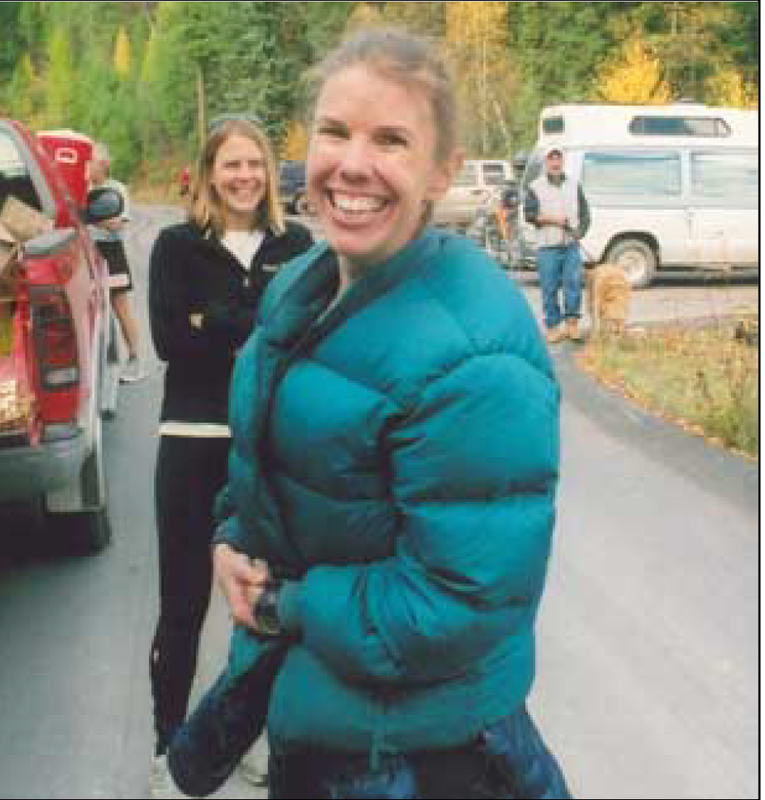 Heather Cauffman takes over as Race Director in an attempt to fill Pat Caffrey’s shoes. The winners of the Ultramarathon are husband and wife in first and second overall, respectively. Debbie Gibson sets a new Womens Seniors record. The Le Grizz kicks off the Le Grizz Relay with two participating teams, both of which had a blast. 2016– Christi Richards returns to the Le Grizz to win both the women’s open and to become the first woman to win the event in Le Grizz history. Debbie Gibson set a new course record for the womens senior division. Creation of the Pat Caffrey award which is also known as the Spirit of the Le Grizz. 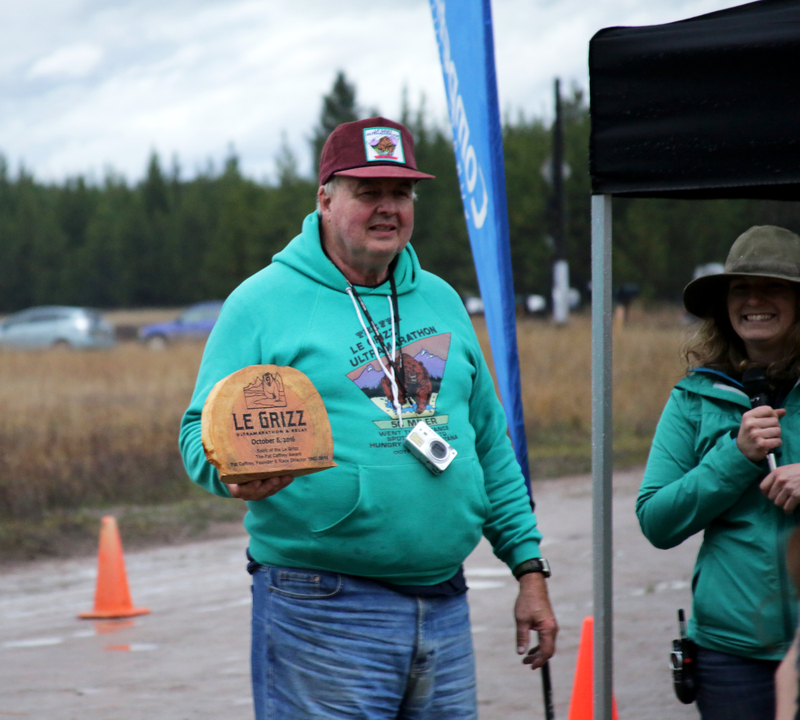 Nominated by volunteers, the recipient(s) shall demonstrate some kind of unique Le Grizz characteristic during the race.